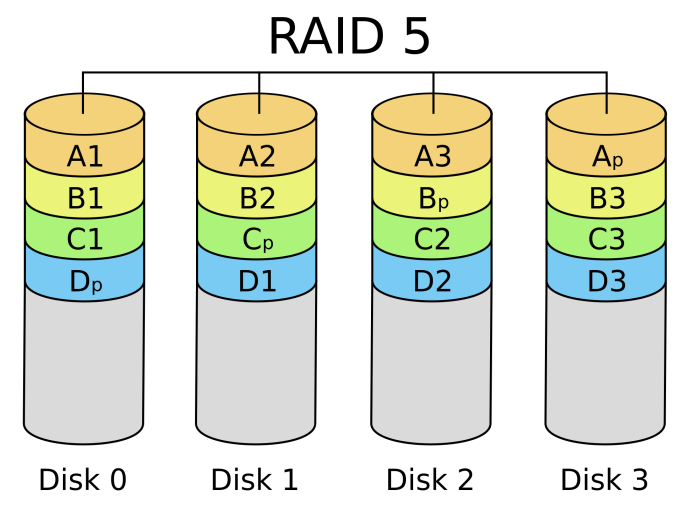 Basic layout of a RAID 5 array. RAID 5 data recovery is one of our specialties. We’ve worked on a wide range of RAID arrays, but RAID 5 is by far the most common array we recover from. When a RAID 5 fails, many of our customers come to us desperate for help. In most instances, a person’s job or business can be on the line when this type of data loss occurs (just look at the 7 IT mistakes that will get you fired…data loss is number 1). Many corporate executives don’t understand why there wasn’t a backup of the data prior to the crash, and that can be a hard thing to explain. We understand how difficult this time can be, and we work with you every step of the way in order to get your data back as quickly and efficiently as possible. 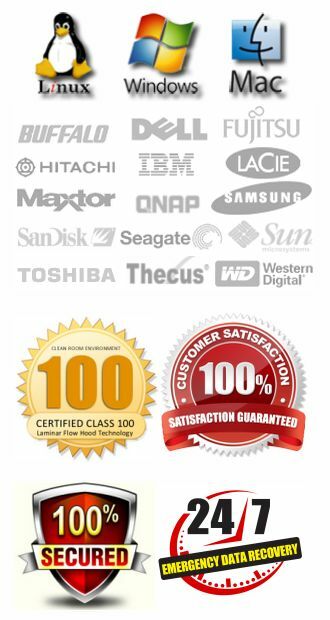 Our RAID data recovery processes are 100% safe and secure. If you lose data on a RAID 5 array, it’s very important to remain calm. In most cases the data will be recoverable. Keep in mind though, the ability to recover the data is going to be determined by the actions you take immediately after the failure occurs. It’s important to note that with the inherent redundancy of a RAID 5 array, data is more resistant to being lost. In almost all of the cases we work on, the overwhelming reason the data ends up being unrecoverable is due to the the actions of the end user. When a failure like this occurs take a moment to calculate what it would cost if you were to lose the data permanently. 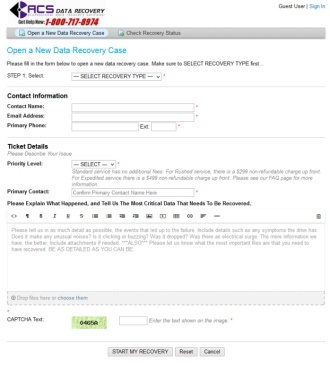 If the data is valuable, call us so we can help you get your data back. We have been successfully performing RAID 5 data recovery since 2003. One of the biggest concerns we have from potential customers is: “will our data be kept secured and confidential?” The answer is a resounding YES! You can click here to read more about how we protect your data. Data security is a primary concern in our business, and since 2003 a wide variety of clientele have entrusted us with some of the most sensitive data imaginable. From health care facilities, defense contractors, law firms, universities, corporations and everyday home users. All of which want their data to be kept completely confidential. Is Data Recovery On A RAID 5 Safe? One of the big concerns our customers typically have is whether or not data recovery on their failed RAID 5 is safe. The short answer is YES! Nothing we do will make the situation worse than it already is. We start off with an initial evaluation just to determine the integrity of the drives, and confirm they are functioning as they should. This usually consists of just a quick powerup to verify there is no unusual noises. If the customer has specified that a drive is making unusual noises, then we do not risk powering it up at all. There are a series of tests we can perform in order to determine how serious the failure is, without risking further damage. In situations where there is a physical problem with one or more of the drives, then we will proceed with making whatever repairs are necessary in order to get the drive(s) functioning again so that we can move to the next steps. How Does RAID 5 Data Recovery Work? We have an exceptionally high degree of success when recovering data from failed RAID 5 arrays. While there are cases that are unrecoverable from time to time, most of these revolve around circumstances beyond our control. Either the platters are severely scored on more than one drive, or there have been processes run by the end user that corrupted the data. If your data is important, then it is critical you contact a reputable company to help retrieve it. If all of the drives are mechanically sound, we start in the safest way possible, and that is by cloning each one. We put each drive in a write-protected mode and then clone it sector-by-sector to another drive. Once the cloning process is complete, we set the original drives off to the side and work strictly from the cloned copies. Working from the cloned copies guarantees that nothing we do will make the situation worse than it already is. While we can technically rebuild the array in our emulator with one drive missing, in order to garner the best results we prefer to have all drives present and operational. So our first step is to work with each drive and make any repairs that are needed. If there is a known “stale” drive…one that has been out of operation for an extended period of time…then we will leave that drive out and rebuild a virtual drive using the parity data that is contained on each of the remaining drives. Once we have all of the drives in place, we determine the stripe size and drive rotation. Once those are known, we can then rebuild the stripe. If the stripe looks good we then destripe all of the drives into a single image. The single destriped image is then scanned and the data is rebuilt. From there we copy the data to the destination drive and send it back to you. How Much Does RAID 5 Data Recovery Cost? The costs associated with RAID data recovery can vary greatly. Much of the expense is dependent upon how many drives make up the array, and to a lesser extent the file system that was being utilized. As a general rule, data recovery on failed RAID arrays can be very expensive. It’s always a good idea to call first and discuss the situation with one of our professionals. We will be happy to discuss the matter in detail with you and explain how we can help. We will also be able to give you a much more accurate expectation on what costs to expect. In most cases, our standard service level can have a recovery completed in 5 to 10 business days. However, we also offer expedited service that gives your job 24-7 attention. Day, night, weekends, holidays, it doesn’t matter. We work on your recovery until it’s completed when expedited. Again, the time required will vary depending on the sizes of the drives and the configuration of the array. We have completed large RAID 5 data recovery jobs in less than 24 hours.